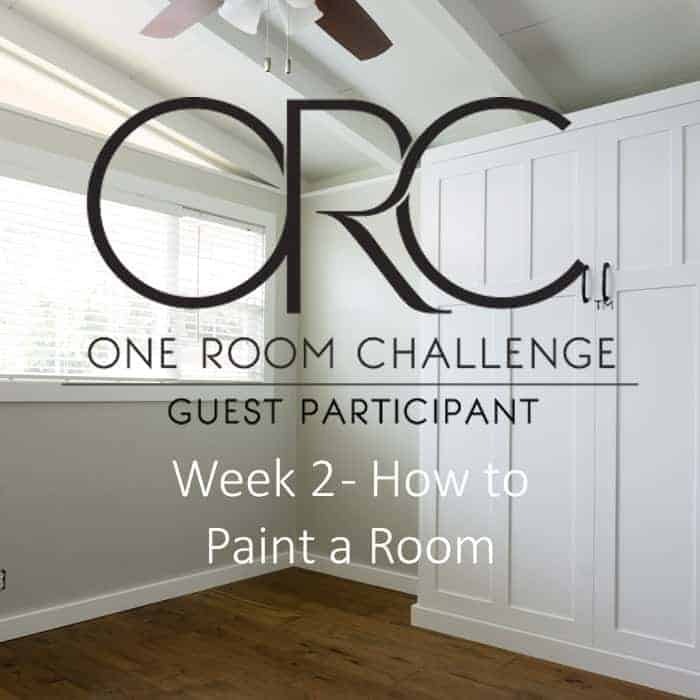 How to Paint a Room - One Room Challenge Week 2 - Girl, Just DIY! Hello and welcome to my Week 2 of the One Room Challenge. I made good progress this week thanks to my hubby helping me bust out some room painting. It was sure nice to have his help. He’s a production guy and I’m a detail girl so we have a nice balance to get the job done quickly and looking great. If you recall from Week 1’s Post I decided to join at the last minute and so I’ve been in a bit of a time crunch. 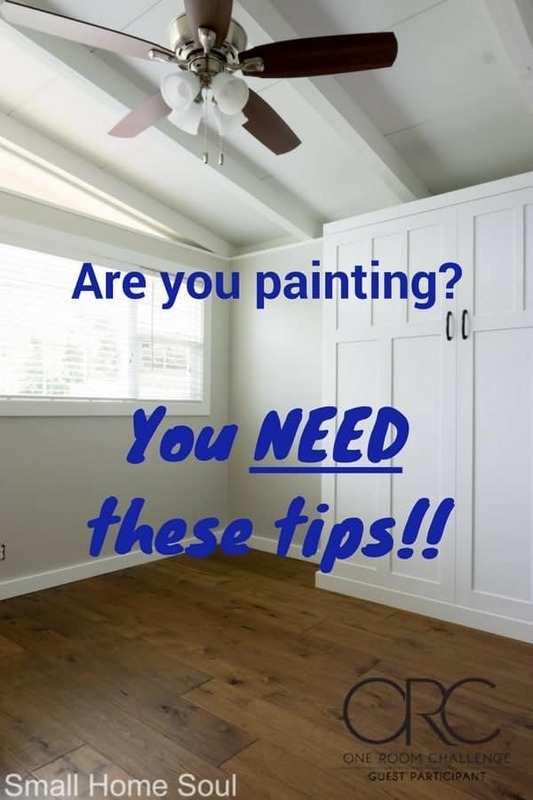 I’m excited to share with you how to paint a room. This isn’t a full on tutorial but I am sharing all the steps and some great tips that’ll help you get the best results. Did you have a chance to check out all the projects from last week? There’s going to be some seriously beautiful spaces created in the next several weeks!! I’ll leave links to the ORC Challenge pages below so you can check out the progress everyone’s made this first week. If you’ve never painted a room before it’s not as hard as it might seem. 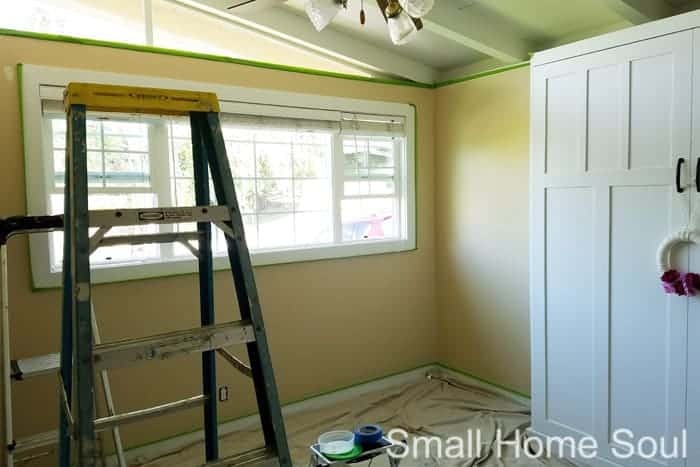 Start small and paint one room before you decide to tackle the entire house. You can do this, I promise! After you decide what color you want head to the paint store or hardware store to purchase your paint. We love Sherwin Williams paint and all their employees have been to formal training so they know what they’re talking about. 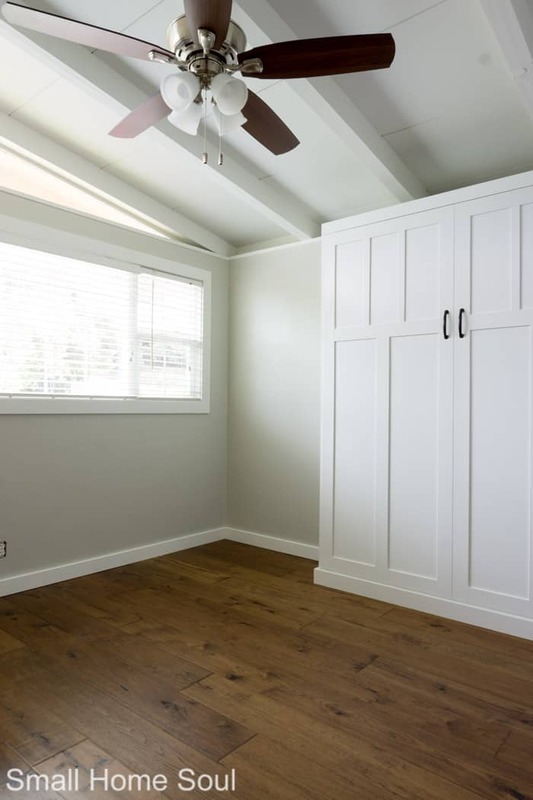 They can help you purchase the best paint and quantity for your room size. I still had some paint left from painting my Master Bath so I only needed to purchase 1 more gallon. 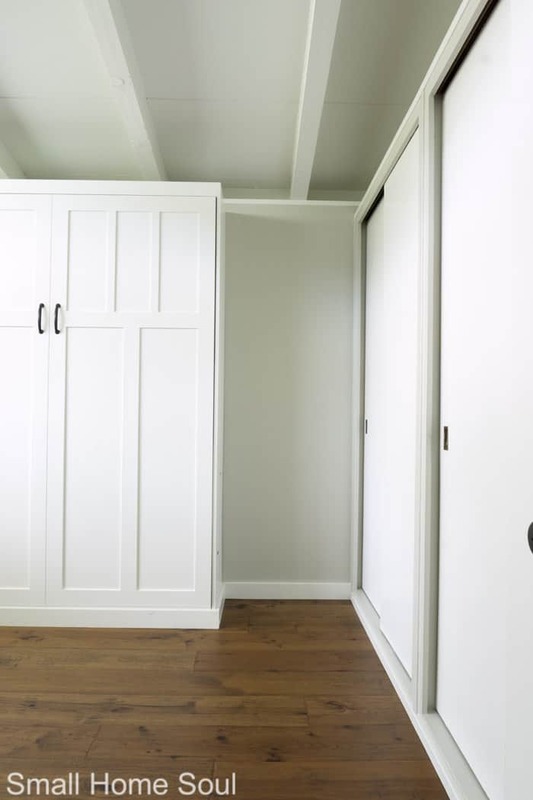 If you’re going to paint a room a lighter color over a darker color you’ll need two coats of paint. We chose to do a second coat in the office. Clear out the room, remove switch-plates and vents, set aside the screws. Sweep cobwebs from the ceiling and the walls. Vacuum the floors to remove as much dust from the room as possible. Use the Spackle and putty knife to fill holes. I love this brand because it goes on pink and when it’s white you know it’s dry. We had some big holes from the TV we had mounted in the room. And there were flat sections in the wall texture where the mounting bracket went. I love this TIP for blending in your patches: I needed quite a bit of spackle over the area so I used a wet washcloth to put a little texture into the Spackle as it was drying. You can also use a sponge, or even add some extra texture with the end of a wet paintbrush while painting. Even with my tired old 50+ year old walls I still try my best to camouflage when we paint. Normally if you have just tiny holes you’ll use your putty knife to fill the holes and leave a bit extra over the hole. Spackle will shrink and you’ll have a divot if you don’t overfill just a bit. Lightly sand away the excess when it’s dry. Wash the walls down with Heavy Duty Cleaner. Make sure you follow the use and safety directions on the box and wear protective gloves. Be careful over the spackle areas or you’ll wash away your patch job. 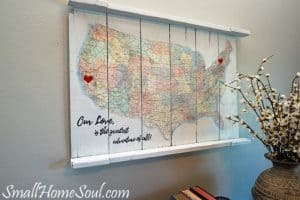 Alternatively wait to spackle until after you clean the walls. Change the water and rinse the walls a few times afterward. This is an extra step that not everyone does because it can take some time. The smartest Tip I can give you is to tape off your trim. Originally my husband wasn’t a believer in taping but I won him over with the nice crisp lines you get as a result. If you’re not good with cutting in by hand around trim-work then I recommend you take the time to tape. 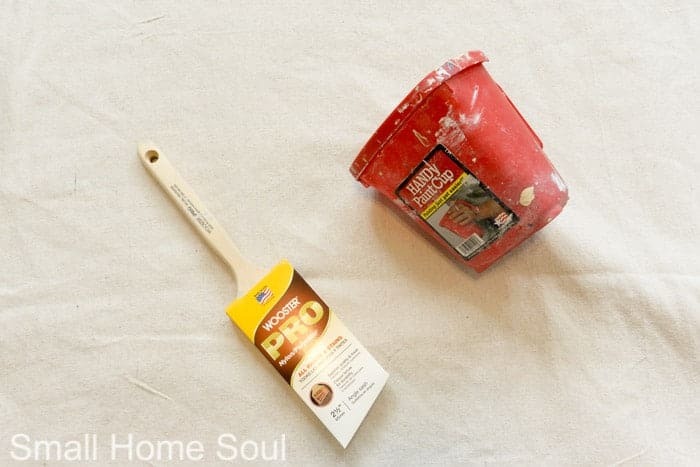 Here’s my best Tip for applying painter’s tape to baseboards and trim. Pull out 6″ or so of tape from the roll. Lay the tape roll on the baseboard and pressed it against the wall. 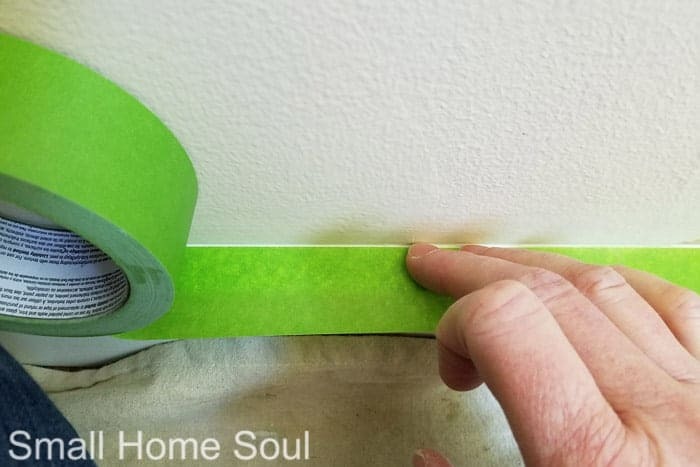 Line up the end of the tape against the wall to top of the baseboard only. Make sure it doesn’t stick up onto the wall. Press down the tape area between the end and the tape roll. Hold the tape in place while you pull out another 6″-8″ and repeat the process. Make straight cuts at corners by placing your putty knife into the corner over the tape and pulling to tear the tape. Tape around the entire room. This method works better than every method I’ve tried. And having longer continuous tape to pull after you’re done painting goes much faster. Haha, I forgot to take down my Spring Wreath. With all the prep completed it’s time to paint. Lay out your tarp(s) so that the entire floor is covered. Have a wet rag handy in case of spills. This is where you paint along the edges of your trim-work to make rolling on the paint so much easier. Wet your Angled Brush a little first (this helps it load paint better). Open and stir your paint. Pour some paint into the Paint Cup. This thing will save your hand and lots of steps up and down the ladder. 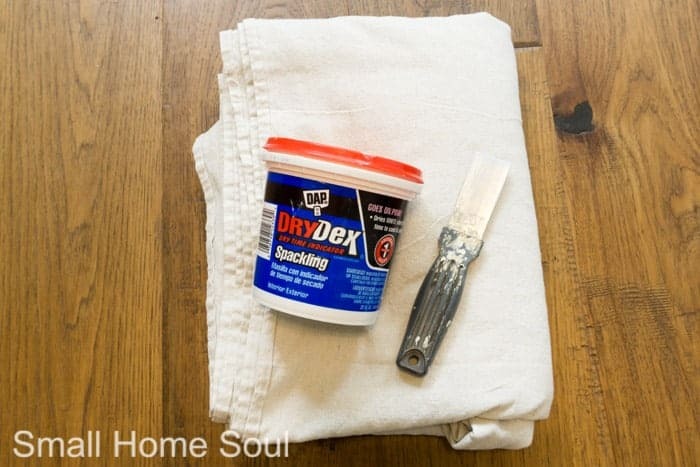 Get your brush wet with paint and apply a little to the edges of the tape first to activate it, then paint the width of the brush around the room. You’ll want to follow behind with the roller as soon as possible but just in case don’t leave heavy lines of paint from the brush. If it dries before you get back to roll over it you’ll have a tough time covering that line. 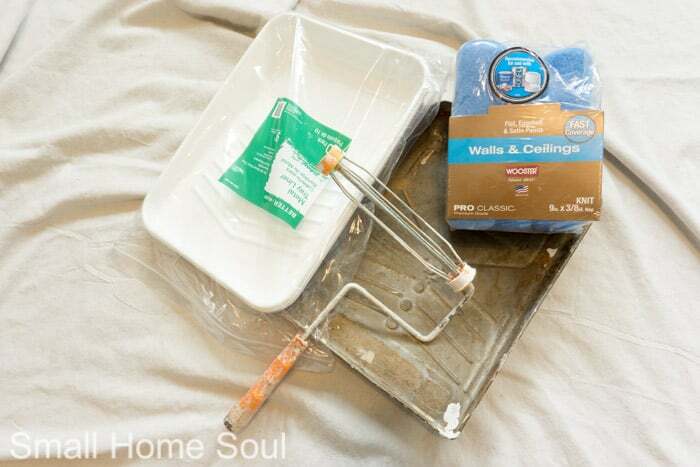 Place a tray liner in the paint tray. Push a Roller sleeve onto the paint roller and just like the brush you’ll want to dampen the roller. We used to buy the cheap ones but they’ll shed on your walls or surface and you’ll spend time picking fuzz off the wall. So spend a little more money to get the quality ones. About $10 for a 6 pack is reasonable. Pour paint into the tray to fill the bottom area and roll your roller into the paint and pull it up onto the bumpy area to distribute it evenly on the roller. Work in about a 4’x4′ area first making an X and then rolling up and down over it to distribute the paint. When you’re done with the last coat of paint follow my final Tip and pull your tape, at a sharp angle off the trim immediately. 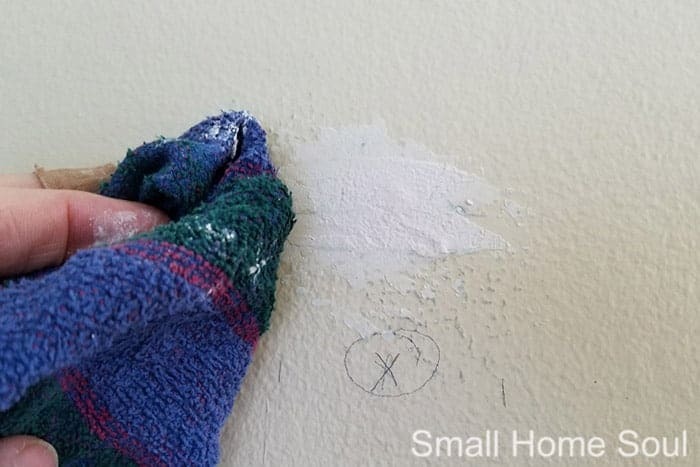 Don’t wait and let the paint dry all the way or pulling the tape when the paint is dry could pull paint from the wall too. If you’re doing two coats it’s best to paint them both the same day, for the same reason. We have some funny angles and awkward shelf areas at the top of this room (not shown here) that slowed us down a bit. Our room took a little longer than a standard room with 8′ ceilings but we did all our painting on Sunday and I’m happy that I can now focus on other areas of the makeover. Give the room a fresh coat of paint. 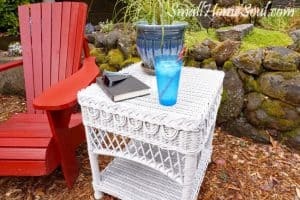 Recover my existing desk chair, or buy a new one. Take down the unused TV. 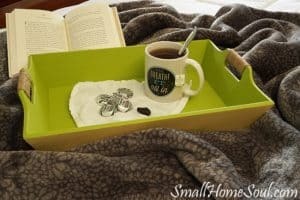 Create organization with peg board or some other fun product. Replace the existing area rug. Install shelves over the desk. 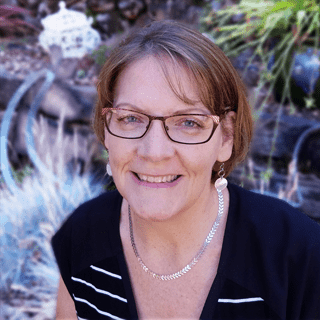 Toni, thanks for letting me feature your office makeover on my color ‘hunt’. It was posted this evening! The new paint color looks lovely! Those ceilings are awesome too! They add so much character to your space. These are some great tips, thanks for sharing! Love that paint color! It’s so bright and fresh now! Thanks Emy, that room needed a fresh new canvas. Gray is the perfect backdrop for creating a colorful and creative space. Toni, you just wrote the best tutorial on how to tape off a room. I low fresh and crisp everything looks. Great job! The room looks so crisp and clean!! I just love a good gray paint color 🙂 I can’t wait see next week!! 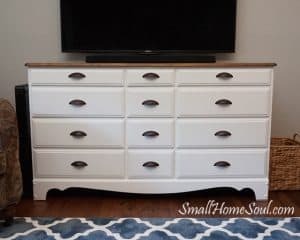 Me too, even my hubby loves it and he’s the one that didn’t want me to paint it 😀 Once the desk is installed everything else will be so much easier. It looks great so far! Want to come over and paint my room next? 😉 Can’t wait to see what else you do with the space! Wow. This is very thorough. I am such a lazy painter. I never tape off the trim. It looks so nice. Your hard work and prep totally paid off! !